White Buffalos boys basketball has lead in third quarter, but fall short to Lava Bears. 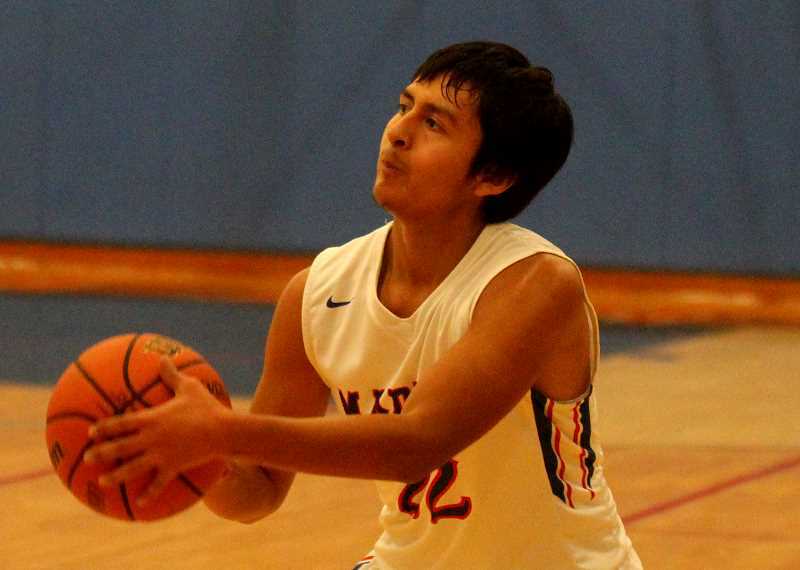 The Madras White Buffalos boys basketball team traveled to Bend High School on Dec. 11 to face the 6A Lava Bears. The Buffs were led by Byron Patt, who finished the game with 28 points, but Madras would lose 68-52. 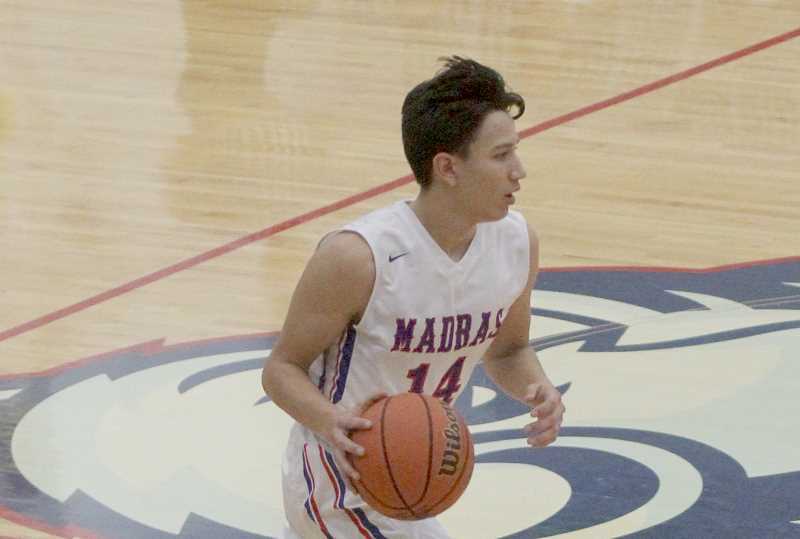 Madras and Bend had a close game and the Buffs were even up by four in the third quarter, but Bend was able to pull away. Donnie Bagley was the first to score for the Buffs to tie the game at 2-2 and later Patt hit a 3-pointer to make the score 6-5 in favor of Bend. That would be the last point Madras would score in the first quarter. The Lava Bears went on an 8-0 run and took a 14-5 lead at the end of the first. The score was 16-5 in the second quarter before Kahne Herkshan hit a 3-pointer. A few plays later a pair of shots by Jordan Mitchell cut down Bend's lead to 21-12. Down 29-15, baskets by Patt and Herkshan kept the Buffs in the game. Miller would score to make the score 29-22 with the Buffs slowly edges out the Lava Bears lead. Patt found his rhythm and hit three 3-pointers in a row to help Madras take their first lead of the game. The Buffs had a 31-29 lead before Brock Mesarich, of Bend tied the game back to 31-31. Bryan Brown would score for Bend right before halftime and the Buffs would go into the halfway break down 33-31. Brown scored for Bend to start the third quarter, but Miller hit back-to-back threes for the Buffs, giving them a 37-35 lead. Brown again kept the Lava Bears in the game with a basket, Patt drilled a deep shot. Madras had a 40-37 lead over the 6A Bend Lava Bears. "There was that one stretch in about a 20 second period where Byron (Patt) scored nine points," head coach Evan Brown said. "He has skills and abilities and we have been running some stuff for him. He has done a good job of knocking down shots." Bend went on a 8-0 run, before the bleeding was stopped by Patt with a basket. A 3-pointer by Brian Warinner before the end of the third gave the Lava Bears a 48-43 lead at the start of the fourth quarter. Patt would hit another three to start the quarter and the Buffs were only down 48-46. A few plays later, Cole White hit a three for the Buffs, who were down 53-49. A few unanswered baskets for Bend extended their lead before Patt hit a free throw. Later in the fourth, Noah Miller scored to make the score 64-52 with less than two minutes in the game. The Buffs were having a tough time scoring and were forced to foul the Lava Bears, who all their free throws. The Bend Lava Bears beat the Madras White Buffalos 68-52. Warinner and Brown led the way for Bend with Warinner scoring 27 points and Brown 21. They combined for 48 of the Lava Bears 68 points. For Madras, Patt scored 28 points and hit six 3-point shots. Behind Patt was Miller who added eight points for the Buffs. "There size took over at the end," Brown said. "We were able to turn the ball over. They turned it over 28 times. We did not shoot the ball great, just OK, but it kept us in it." "They just tried to use their height and throw it over the top of us," he said. "Sometimes they were successful and sometimes we were able to get enough pressure to get a hand on the ball, which allowed us to get out and go." "We are just getting a lot of shots up," said Brown. "We did a big team building exercise in a scavenger hunt. That always ends with dinner at Abby's and they presented the things they found and paid the consequences with the things they did not find. So they were singing Jingle Bells in a packed Abby's Pizza last night." The White Buffalos will not have another home game until Jan. 4, when they will take on the 6A Mountain View Cougars at 7 p.m.